Who can identify this bus? All I can tell is that it appears to be a 1000 or 7400, had a pretty authentic looking RTA sticker, but does not have an authentic number, either the number or the font it is in. So, what's the context of the picture? The Fishbowls are very hard to discern... 1000 to 9600, they almost look identical(at least to me). Maybe a Fishbowl buff can point out the differences. One thing that should at least eliminate one series comes from Kevin's "Buses" page. According to his info, the 1000's never were painted in the white, red and blue scheme, while the 7400's, 9000's and 9600's were(at least some). So if the 7400's are easily discernible from the 9000's and 9600's, then you know what series this mystery bus came from. I think it's another case of a bus from California painted in a CTA livery. (like the bus here http://forum.chicagobus.org/topic/1936-another-300-alive-and-well-in-sunny-california/) There's obvious differences that were never on a CTA fishbowl like high back seats and the bus looks like it has no AC built in the rear. But the one thing that really disqualifies it is that the bus has a GM badge on it. All 70's fishbowls were GMC's. I believe only the #100 and #300's were GM's. I have to go along with BusHunter and jesi on this. Looking at the cta sticker, another fairly obvious difference is that it is a pre-70s New Look in that the marker light over the front door is square and has the chrome strip behind it. What it attempts to portray is 1226 on busdrawings.com, but you can tell that difference. As far as differences between the series, 1000s and 7400s generally had chrome bumpers while 9000s and 9600s generally had rubber ones, although some 1000s had the rubber bumpers filled with water. Those apparently were subject to change. Also, the 1000s and 7400s were more likely to have a lime "Air Conditioned" decal over the front door, although those undoubtedly could be removed. sw: I suggest you look at busdrawings.com CTA page and click through that. 1233 is more typical of how the 1000s were in their early years (before the RTA). 7449 is also typical as how they were as delivered. It is very hard to identify. The easy answer would be to say it is either a 1000 series or 7400 series GMC Fishbowl. However, because of the sliding windows, it could be a 9000 series or 9600 series bus as well. I say that because in the late 1980s and early 1990s when the retirements started, different things started happening. Some of the 9000s and 9600s that had bumpers started losing the rubber bumpers in favor of the chrome ones. I remember one of the 9600s having the original driver's windows replaced with the big sliding windows normally found on the 1000s and 7400s. Even 9683, which once had a bell chime got it replaced with the "buzzer" chime found on the 1000s/7400s. The actual bus number on this picture seems to be 5505, which of course was nonexistent for this type of bus in CTA's fleet. So unless there is an interior shot, it would be difficult to gauge which series this bus belonged to. Like I said earlier, the safe bets belong to the 1000s or 7400s. 9600 series had 3 roof hatches, one in front and two in the rear. 1000 and 7400 series buses had manual parking brake. 9000 and 9600 series had air parking brakes as well as the rear door also acting as a brake.. Looking at the open front door, it doesn't even appear to be a CTA bus. Even the amber light over the front door is square, something not found on any CTA bus that I can remember. I really can't see anything in the rear that resembles where the air conditiion unit would be, so my honest opinion would be that this bus is not a CTA bus at all, but painted in a CTA scheme and given a fictitious number. .
Well, when I was in high school in the early 80's, along Addison 152 we would call it "my big Green limoSine". There were a LOT of these throughout the north side at that time - if it helps anyone figure out which series they were/are. Wow some great spotting, did't notice the rear door thing. The 2 spotting features for me were the # and the one no one else seemed to notice, the clearance lights. Note that they are the Art Deco style of the first generation on 'bowls. Since this bus is a 102", 40' it would be a 5301. Of CTA's 2 orders of 5301s only the 100s had these factory style lights. Don't believe any100s ever got this scheme. The bus is supposedly SCRTD same # painted for the movie "Girls just have to have fun"
Saw the movie, noted the model/paint discrepancy but never knew the story. From Scotty Richards at his movie bus business. Look above, art and I did. What Pace bus had a four piece rear door? I believe Pace inherited a few South Suburban Safeway fishbowls with four-piece rear doors... Or maybe that was still the RTA days??? For the types depicted, that's probably correct. They may have been Pace for a bit, but undoubtedly replaced with the earliest 8700s. Mel's other pictures around that one of 800s are apparently ex-West Towns (he added that to the captions). I thought they were all replaced with RTA 8000s, but Mel's pictures and CPTDB indicate that they hung on, apparently distributed to what we would now consider North Shore and North routes, as well as Joliet. In fact, I am surprised that there is an ex-Elgin 1940s vintage old look GM, apparently on a Waukegan route with RTA paint. The ones that hung on until approximately the early 1990s, such as South Suburban 700s, were piggyback orders from CTA ones. Elgin 1040's had the 4 piece rear doors. Back in the 90's Highland Park had them painted in the Pace Blue Yellow and White. Photo from Mel Bernero as posted on Flickr. His collection is priceless. My bad that's what I get for trying to read this on my IPhone! I enlarged this image. The last word looks like it starts with an "S" and ends with "party"
If you buy Graham Garfield putting ® on everything, maybe the studio didn't want to infringe trademarks. But, personally, I couldn't get a clear enough enlargement of your clip before it pixalated out (using Windows Photo Viewer). Downloading the original, I can see your point at about 50% up the slider. Surfing the net, I came across a link here http://forum.bustalk.info/viewtopic.php?t=3284 which shows all the different things tried with the GM new looks. Kind of interesting, a few things I didn't know like there were new looks with lifts, buses powered with steam, and other weird things like bike racks (maybe the first ones) installed. There's also a section on CTA #300's, which shows a picture of the prototype #300. As far as the jackknife doors, researching this I learned that they were optional, (the standard equipment was the CTA type) and could be ordered through 1968. They claim they were controlled by the driver. Did any of those doors ever open manually? it would be kind of interesting to see a demonstration. The thing I didn't know about (or didn't notice) is that the 300s didn't have turn signal bezels. The steam ones seem bizarre, as did some trolley buses with new look bodies (such as the Toronto ones rebuilt with Flyer bodies and Edmonton then new ones with Brown Boveri equipment), and some Canadian articulated buses with New Look sides and a Classic front. I don't know about jacknife doors, but common in Toronto were rear doors like what were on the CTA big greens (double flow rear doors) except those were usually treadle operated instead of push. As far as Chicago, the main change seemed to be that some CTA and more Pace ones got electronic signs. The Frankenbus and the one rebuilt with the RTS back have been documented elsewhere here. Back to the jacknife doors, there is a couple pictures here http://detroittransithistory.info/PhotoGalley/Photos1960sB.html that show the interior of the jacknife doors. (it's fascinating how similar detroit's livery is to Chicago's at the time) Interestingly enough the doors kind of resemble blinker doors even though they don't open the same way. If the reference is to the four part rear door, that seemed to be common to transit authorities other than CTA and apparently TTC. 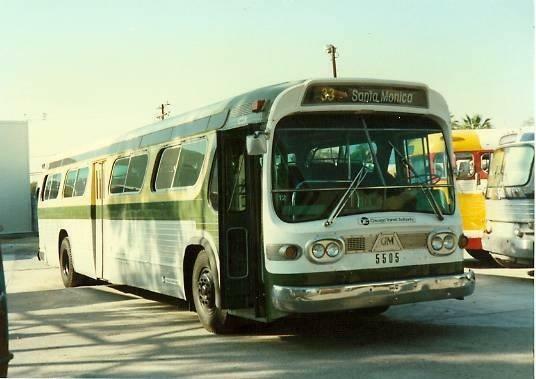 Also, old look GMs had 4 part front doors and some Flxible Metros also had 4 part front doors (I rode some 100 series ones in Rochester; picture of a similar LA one.). Being a kid, the main thing I remember about the 4 part doors on old looks is that back doors folded out, which was o.k., but the front ones folded in and would crush your toes if you didn't jump up from the bottom step. All were air operated; there weren't push bars. On the Detroit page, I'm surprised that they didn't like the Flxible New Looks when Chicago had no problem with them. On the other hand, Detroit had a preference for GM into the 1980s for I suppose obvious geographical reasons (just like Ohio TAs liked Flxibles). Got a question. Back in the 1980s, Forest Glen temporarily had GM fishbowls 310, 315 and 333 (maybe others) that came from different transit properties. They were not from the original 300-449 series. Can someone, Busjack, Andre, David tell me about them? I have pictures of them found on the net some time ago. It's been so long ago that I forgot what site I got them from and therefore who gets credit for them, so I hesitate to post them. This is what Andre said about them. I think hopetunnel has some pics. My all time favorites were the west towns fish bowls that were at forest glen in 1982. Never rode a early 60s model fishbowl. This was like the only set of early 60s buses I ever rode.